🍣 Sushi Emoji is the picture of the most popular Japanese meal of rice and a slice of fish on top of it. It can symbolize both as a specific dish and a tasty array of authentic Japanese cuisine. This emoji can show that you like healthy foods from Japan, or plan to visit a restaurant with Japanese cuisine. Also can be applied to refer to seafood in general. 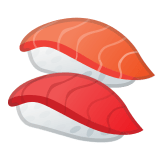 Sushi Emoji was approved as part of Unicode 6.0 standard in 2010 with a U+1F363 codepoint, and currently is listed in 🎂 Food & Drink category. 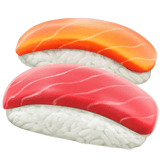 Use symbol 🍣 to copy and paste Sushi Emoji or &#127843; code for HTML. This emoji is mature enough and should work on all devices. You can get similar and related emoji at the bottom of this page.